Like historic buildings, our nation’s natural landscapes tell a story about our past and reflect our future—yet climate change threatens the natural beauty that surrounds us. At the Grace Hudson Museum and Sun House, the historic home of artist Grace Carpenter Hudson in Ukiah, California, an exhibit called Beauty and the Beast: California Wildflowers and Climate Change highlighted the tension between the beauty of California’s native wildflower population and its potentially disastrous fate in a changing climate. 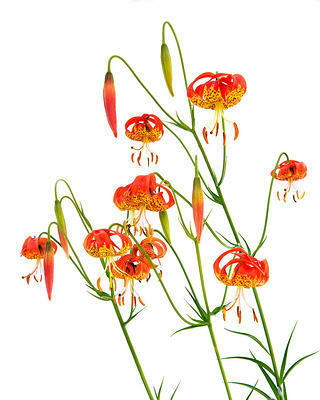 Business partners for more than 30 years, artists Rob Badger and Nita Winter capture the attention and imagination of their audiences through unique photographs of California native plants and wildflowers. They brought their collection to the Grace Hudson Museum starting in February 2018 with Exhibit Envoy, which organizes small exhibitions for institutions around California. Photo of California Leopard Lilies at Mount Tamalpais State Park, Marin County. For the photographers, the reasoning behind capturing the wildflowers is clear: They intend not only to celebrate the flowers’ beauty, but to draw attention to the threat that will impact them the most. Variations in temperature, changing rain patterns, and lack of rain play with the life cycles of native plants, as well as their abundance; climate change even threatens their very existence, if it becomes severe enough. Some of the most stunning exhibition photos, like those of the so-called “50-year blooms,” illustrate this point. While the blooms had at one time only occurred every 50 years, extraordinary blooms have now come and gone several times within the past decade. The beauty of the blooms further emphasizes the danger that faces these flowers and the surrounding landscape. Shooting Stars by Grace Hudson, watercolor on paper. No date. 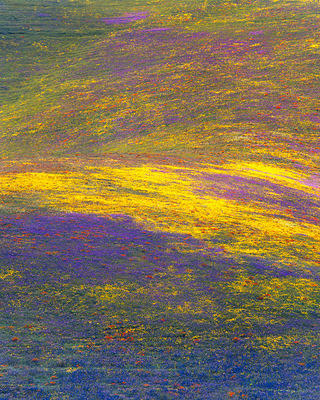 Photo of Monet's Carpet in a "50-Year Bloom" in Gorman, Peace Valley, Tehachapi Mountains, Los Angeles County. The exhibit falls neatly into the mission of the Grace Hudson Museum (a member of the National Trust’s Historic Artists Homes and Studios program): to emulate the life and legacy of Grace Hudson and the Pomo Indian Peoples. Hudson not only enjoyed the outdoors herself, but she also often sketched and painted wildflowers and fields near her home. (Some of these lesser-known works were used as backgrounds for Hudson’s more famous numbered oil paintings.) 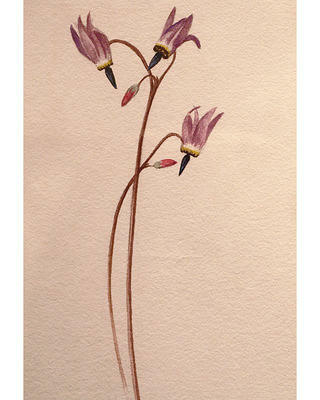 About a dozen of her sketches, watercolors, and oil paintings of wildflowers are featured in a supplementary display to the main exhibit. The exhibit also shows how California native plants were significant in people’s lives throughout history. The Pomo people, who made up over 70 politically independent “village-communities” in California’s Sonoma, Mendocino, and Lake Counties, were known in part for their considerable skill in basket weaving, made using native plants of Mendocino County. Hudson and her husband had a great interest in Pomoans they came to know, and they learned about their languages, culture, and basketry. In addition to the exhibit itself, the Grace Hudson Museum created several weeks of programming to further highlight the issue of climate change and its impact on the natural world. One talk on a 2018 book called Climate Change, Species Extinction & Citizen Science by Mary Ellen Hannibal, explained the methods everyday people can use to advocate for climate justice. Another program illuminated climate change’s impact on pollinators like birds and insects, many of which were captured in photos from the main exhibition. 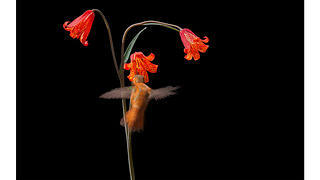 An exhibition photo of a rufous hummingbird sipping from a scarlet fritillary flower—one of Burton’s favorites—exemplifies the delicate relationship between California’s wildflower population and local pollinators. Wrapped photo of a Rufous Hummingbird at a Scarlet Fritillary. 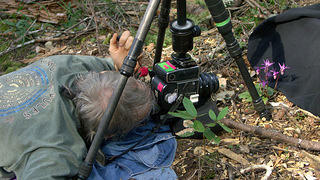 Rob Badger photographs Calypso Orchids at Mount Tamalpais State Park, Marin County. 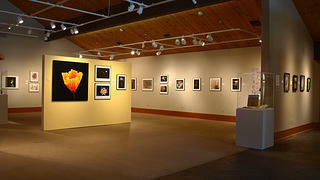 "Beauty and the Beast: California Wildflowers and Climate Change," installed at the Grace Hudson Museum, Ukiah, California. 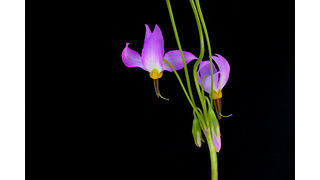 Wrapped photo of an Alpine Shooting Star from the John Muir Wilderness Area, Inyo National Forest, Sierra Nevada Mountains. A talk on June 16 from local historian Dot Braverney uncovered the history behind “Dean of Wildflowers” Carl Purdy. Purdy was a contemporary of Grace Hudson—their mothers were friends—and he developed a wildly successful business harvesting wildflower seeds in his area and cataloging them. This program wrapped up the exhibition at the Grace Hudson Museum, which ended on June 17, 2018. However, it will continue on with Exhibit Envoy at the Fullerton Arboretum starting on September 2, 2018.